Xavier Distance 4 Dreams: We Did It! 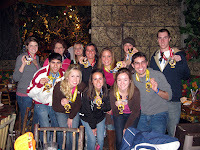 Congratulations to the 2010 Xavier D4D Team on their first trip to the Disney Full and Half Marathons. Here's to 2011!